Merced, CA (February 5, 2018) - The World’s best waves and wake surfers will be showcased at the 2018 Centurion World Wake Surfing Championship presented by GM Marine September 6-8, 2018 near Salt Lake City, Utah. The Centurion World Wake Surfing Championship presented by GM Marine is back for 2018 as the pinnacle wake surf event of the season. 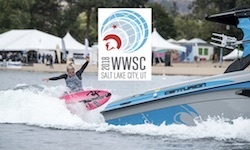 The 2018 WWSC will be held September 6th through the 8th at Cemetery Point Beach on Pineview Reservoir in Huntsville, UT near Salt Lake City. Hosted by local Centurion Boats dealer BoardCo, the World Wake Surfing Championship will showcase the Worlds best surfing as well as offer an exclusive VIP experience for present and potential Centurion boat owners. Past, current and aspiring champions from all over the world are traveling to World Series of Wake Surfing events to earn a CWSA (Competitive Wake Surf Association) ranking that qualifies them for wake surfing’s equivalent to the Olympic Games, the Centurion World Wake Surfing Championship. The official wake surf boats for this World event are the towboats with the biggest waves and deafening industry buzz. Centurion boats with the Opti-V Hull will tow this year’s event to pull another field of World Champions to their personal bests. Last year we saw 58 personal bests achieved behind the Centurion Ri Series during the Worlds competition. Book your travel to witness the perfect rides behind Centurion boats at the 2018 Centurion World Wake Surfing Championship presented by GM Marine. Contact your local dealer today to experience the perfect ride every time with the Official WWSC Towboats with the Opti-V Hull. The Centurion World Wake Surfing Championship presented by GM Marine is going off in Huntsville, UT near Salt Lake City, Utah for 2018. September 6th through the 8th the World’s best wake surfers will be turning heads on Cemetery Point Beach at Pineview Reservoir. Water depths and beachfront viewing are optimum for a surf event of this caliber. There is also amazing local Centurion support for this event with the World’s largest Centurion dealer, BoardCo. BoardCo will have Centurion boats on display and be participating in the exclusive VIP experience with some of their present and future Centurion customers. Centurion boat owners from other areas are encouraged to contact their local dealer to secure a WWSC VIP pass. Thank you to the first 2018 Centurion World Wake Surfing Championship sponsors that have already signed-on to make this World Class event possible. GM Marine, Ashland, Extreme Custom Trailers, Roswell Marine Audio, Gator Step, PCM Engines, and BoardCo. If you are interested in sponsorship opportunities please email buchners@centurion-supreme.com. About Correct Craft: Celebrating 92 years of excellence in the marine industry, Correct Craft is a Florida-based company with global operations. The Correct Craft family includes Nautique, Centurion, Supreme, Bass Cat, Yar-Craft, SeaArk, and Bryant boat companies, Pleasurecraft Engine Group, and Aktion Parks. For more information please visit http://www.correctcraft.com/.